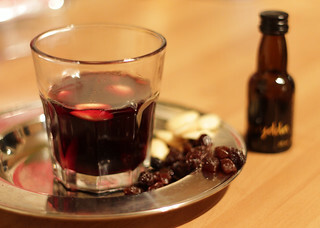 Living in the US it can be hard to come by glögg which is Swedish mulled wine, and if you my some miracle manage to find some, it usually isn’t any good. I have resorted to make my own, which in my opinion is just as good as what you can buy in Sweden. The problem is finding some of the ingredients, but Amazon is your friend. And pour dark rum over it until everything is covered (about 1 cup). This will be enough extract that you can save half for a second batch. Let it sit at least 4 days but the longer it sits the more flavor it will extract. I have let it soak for up to 3 months. Shake lightly daily if you are doing a quick batch. Buy 2 bottles of cheap but drinkable wine, add one cup of sugar in a pot with enough wine to cover it. Then slowly heat and stir until the sugar is completely dissolved. Pour the rum through a strainer which you can coat with a paper towel, and add it and the rest of the wine to the pot and heat (but don’t let it boil). Serve in small glasses with blanched almonds and raisins. Enjoy!